ROAD TOWN, Tortola, VI – Despite Minister of Finance and Premier Dr the Honourable D. Orlando Smith (AL) stating that the Virgin Islands (VI) is back on its feet and ready for tourism season, he sang a different tune while speaking before the International Development Committee in the United Kingdom on Tuesday October 31, 2017- that the people of the Virgin Islands were “battered and shattered”. The Minister of Finance told the committee it is also estimated that almost 80 percent of buildings have been damaged and many are uninhabitable or beyond repair. In addition, he stated that the infrastructure and many important services were severely impacted. Government buildings, including those of the police, fire service and the prison, suffered major structural damage, according to Premier Smith. 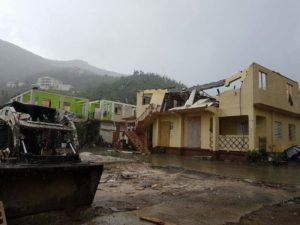 Premier Smith informed the committee that the preliminary estimate of the cost of the damage ranges up to $3.6 billion which is 3.5 times the Virgin Islands pre-hurricane Gross Domestic Product (GDP). During his initial speech to the committee, Premier Smith expressed that insurance will cover some of the losses specifically for the private sector, but coverage is far from universal especially among homeowners, while noting that the tourism sector, the single largest source of employment and biggest contributor to our GDP, has been severely impacted. “The overall damage caused by the hurricane will inevitably have an impact on the GDP and BVI government revenues,” emphasised the Premier. It was on October 26, 2017 when Premier Smith controversially stated that the Territory is back on its feet and open for business. Speaking on the strengthening of the police force due to additional officers from the United Kingdom, The Cayman Islands and Bermuda, and the imposition of a curfew intended to protect businesses and uphold law and order, Premier Smith assured that all is well. “We are also able to increase their visible presence during the day time in the key commercial areas, again providing security and assurance to businesses that we are back on our feet, that law and order is restored and policing is functioning normally,” said Dr Smith. This statement drew a number of responses from persons who disagreed. “Now that is a serious statement. The definition of being back on your feet is that the challenges and issues that you suffer before are now corrected and that is not the case,” Former Permanent Secretary and businessman, Mr Julian Willock had stated on Honestly Speaking on ZBVI 780 AM radio on Tuesday October 31, 2017.